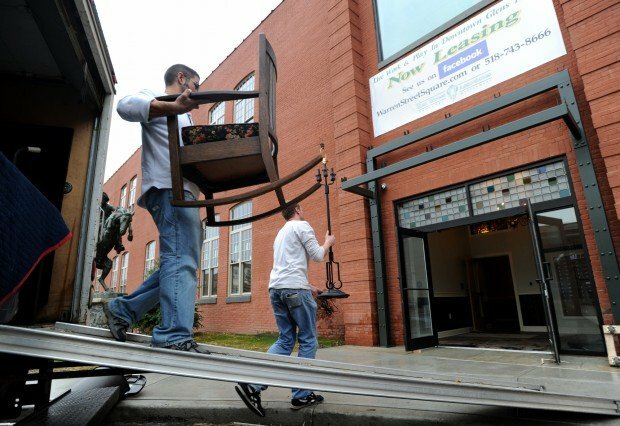 Jason McKibben - jmckibben@poststar.com Anne Powers watches as movers John Payne, from left, and Shane Magner place a dining table in her new Warren Street Square apartment in Glens Falls on Wednesday, October 26, 2011. The complex, with a mix of commercial and residential space in a rehabilitated carriage factory, is the latest in Glens Falls to offer a downtown living experience. Powers, who works at the Glens Falls Hospital and is downsizing from a house to an apartment, said she's looking forward to walking to work. Jason McKibben - jmckibben@poststar.com Movers John Payne, from left, and Shane Magner carry some of Anne Powers' belongings into the Warren Street Square apartments in Glens Falls on Wednesday, October 26, 2011. The complex, with a mix of commercial and residential space in a rehabilitated carriage factory, is the latest in Glens Falls to offer a downtown living experience. Jason McKibben - jmckibben@poststar.com Anne Powers moves dishes into the kitchen cabinets of her new Warren Street Square apartment in Glens Falls on Wednesday, October 26, 2011. The complex, with a mix of commercial and residential space in a rehabilitated carriage factory, is the latest in Glens Falls to offer a downtown living experience. Jason McKibben - jmckibben@poststar.com Pete Jaikin of CR Drywall installs insulation in one of the commercial units of Warren Street Square in Glens Falls on Wednesday, October 26, 2011. The complex, with a mix of commercial and residential space in a rehabilitated carriage factory, is the latest in Glens Falls to offer a downtown living experience. Jason McKibben - jmckibben@poststar.com Developer Peter Hoffman opens the window blinds in a one of the vacant units during a tour of Warren Street Square in Glens Falls on Wednesday, October 26, 2011. The complex, with a mix of commercial and residential space in a rehabilitated carriage factory, is the latest in Glens Falls to offer a downtown living experience. GLENS FALLS — About the only time Joe Rybka uses his car is when he drives out of town for an occasional weekend hiking excursion. Rybka, a tenant in the new Warren Street Square complex, walks back and forth a little more than two blocks to his job as a database administrator at Glens Falls Hospital. When he socializes with friends, they meet at downtown restaurants to which he can walk. His aunt lives in The Mill, another relatively new downtown apartment complex, about two blocks from Warren Street Square. So they meet in the middle for a meal or shopping together on Glen Street. Tamarra Cararra Ellsworth, another Warren Street Square tenant, said she drives to her job as a team leader at the C.R. Bard plant, about a mile away, but that's because she likes her new car. "I just got a Lexus, so I definitely drive to work," she said. But she walks to shop, bank and dine out a lot more now than when she lived in a suburban neighborhood near the Hiland Park Country Club in Queensbury. Rybka and Ellsworth are part of a demographic that real estate analysts call "new urbanists." They may be young professionals or 50-something singles and couples approaching retirement age, but usually they aren't young families with children. Regardless of age, they have a common desire to live in downtown settings but want the upscale accommodations they have been accustomed to in the suburbs. "You know, the granite countertops and that sort of thing," Ellsworth said. Warren Street Square is the latest of several downtown projects that have been developed in recent years in response to that trend. The L-shaped building, located at the corner of Warren and Jay streets and stretching in the back to Fredella Avenue, was once the location of the Joubert & White Carriage Co., a carriage and buckboard manufacturer that operated in the early 1900s. Developers Peter and Suzanne Hoffman renovated the building for 27 luxury apartments and for retail and office space. Monthly rent for apartments ranges from $700 to $1,395, plus utilities, depending on the size of the unit. As of Wednesday, 11 apartments had been leased, said Suzanne Hoffman. Other upscale downtown apartment complexes include The Mill, located at the corner of Hudson Avenue and Elm Street, which has 52 apartments; Empire Theatre Plaza on South Street, which has eight apartments; and Pruyn Flats, at the corner of Elm and Exchange streets, which has 12 apartments. Developers have said their buildings consistently are full, and they have lists or prospective tenants waiting to get in. Another 30 apartments are planned for the Renaissance Plaza, formerly the Godnick's Grand Furniture store, on Glen Street. Downtown merchants and city officials say the trend is bringing steady customers to downtown shops and restaurants. "We've always been involved in the library and other things downtown," said Ben Pratt, who with his wife, Mary, moved to The Mill about 18 months ago. But now, they attend even more concerts and lectures at The Hyde Collection, movies at Crandall Public Library and shows at Charles R. Wood Theater, particularly in the winter. "In the middle of the winter when you're going to go out of the garage and drive downtown (from Queensbury), even if it's only 12 minutes, you're not going to do those things," he said. "Whereas if you can just walk, you do." Pratt, a lawyer with Bartlett Pontiff Stewart & Rhodes, said they previously owned homes in Queensbury and Maine. They sold the Queensbury home when they moved to The Mill. "We were empty-nesters at that point. The kids having gone to college and gone to graduate school and being out on their own," he said. Pratt said they have primarily the same social circle as when they lived in Queensbury but mostly meet up with friends downtown. Pratt said there are a few types of businesses he'd like to see downtown that aren't there now. "The first thing that would be great is if there were a kind of high-end deli, bodega (Latin-American style market) kind of place where you can get some groceries, some fresh vegetables and stuff like that during the week," he said. "We go to the farmers market every Saturday, and that's great. But it'd be nice to have like a Putnam Street Market kind of thing," he continued, referring to a popular upscale market in Saratoga Springs. "That's the primary things, and obviously you always want more retail," he said. Anne Powers, who just moved into Warren Street Square, echoed that suggestion. "A good clothing store for average people - and groceries," she said when asked what type of stores she has to drive to patronize now. Powers, a surgical nurse at Glens Falls Hospital, said her car has about 48,000 miles on it, and her expectation is it will be the last car she ever owns because she'll primarily be walking. "I'm near work. I'm near church. I'm near the library. I'm near the coffee shops," she said. Powers said she's thrilled with new her apartment, with its hardwood floors, brick walls and wood beams but modern kitchen and laundry fixtures. "It has character. ... Oh, it's beautiful," she said. Powers said she likes the view from her window of the Finch Paper mill. She said it reminds her of a watercolor painting the son of a friend did a few years ago of the mill as seen from the Cooper's Cave Bridge. Paying $1,800-$3,000 per month for an upscale downtown apartment (eg. The Mill) is a dream that a tiny % of native Glens Fallsians can make a reality. My guess is 5% or less of GF born/bred/educated have the financial success afford an apt downtown. Not only would it require an income two and a half times above the $43k median (ref: city-data.com), but it would require that the person doesn't have kids, STUFF, or a couple cars. That's a rare individual, such as a downstate empty nesters in their 60s (sold their $400k+ single family homes) or hip 40-somethings from out of state (e.g. docs or execs at GF hopital) recently divorced, financially flush and starting w/ a clean slate in quaint, relatively inexpensive GF. These folks have very limited baggage. That excludes the average successful GF local; with wife, children, a couple cars, and doesn't work in downtown GF. It's unfortunate but true that the prototype downtown apartment renter/owner is so far outside the GF demographic. Cool idea, hip living, urban and green to our planet. WTG, the evolution of downtown Glens Falls has begun and newsflash, it's a fantastic thing. That's nice, but I hope Glens Falls never goes back to whining about how it did lose most of its young adults. This is why. These are the people that are making landlords raise rent prices because they know they can get people to pay those prices. And yet, the economy here is still terrible and it is rare to find a job that pays an income that could pay the rent, unless you have already been established in Glens Falls for decades. How nice. And they managed to do it without ripping off dozens of investors! How novel. Bravo to the Post Star for finally interviewing articulate, educated individuals who really have always proven part of the strong community fabric of this little city. This article shows how far Glens Falls has come in reviving itself in the last 10 years, and speaks volumes about the type of people that live here and will want to live here. Congratulations to all of the business owners, developers, and citizens who chose to take a risk, and put quality of life over cost. Well done. Hopefully it signals the cookie-cutter trend has finally come to and end. Bravo! I go through twice a day, 6 days a week, right past the mills and I might smell it once a week. I don't know what they've done, but it has to be something good. It's nice to see these old historic buildings being refurbished and occupied rather than torn down.There is obviously a demand for living accomodations such as these. Businesses will benefit and more entrepreneurs may be encouraged to locate downtown. This is a great trend to return downtown to its former popularity. It's a financial benefit that the people occupying these apartments have the disposable income, maturity and taste to shape the development of retail industry. They want high(er) end stores: health food, clothing, responsible entertainment options. They don't want more bars, antique shops, tatoo/head shops, etc. They'll spend their money in the best restaurants, and the best presented shops. This is a departure from the demographic that lived in low rent accomodations and wandered South Street during working hours going in/out of OTB, Sandys and hung out near Madden. Thank goodness we're seeing a positive change in our lifetime. Excellent job Mayor and Glens Falls City officials. By the way, are more of these high end apartments only for lease/rent - or are they for sale?? "...she likes the view from her window of the Finch Paper mill." It would be interesting to follow up with this resident and her neighbors about six months from now. The smell from the mills is so bad that you can't even open windows for some fresh air. A grey soot will soon be deposited on her patio furniture and car. Yes indeed, urban living at its best. Not a bad looking apartment for the price! And, if you need some crack or heroin, it's always just a short walk around the corner!